There are several pulling exercises that for some, a parallel grip would be more beneficial. The parallel grip can be used for variety or when flexibility does not permit the standard overhand grip. I have found the parallel pull grip to be helpful and so I decided to make one myself with scrap materials or materials that are easy to procure. With a parallel grip you have the best leverage, as both the elbow flexors and the shoulder extensors are in their most effective line of pull. You will find that this grip has the least amount of stress on your wrists, elbows and shoulders. It is the form of chin-ups where you are most likely to be able to use additional loads. For the bent-over T-bar rows, a closer parallel grip increase lat involvement by emphasizing shoulder extension over transverse extension. Keep low back straight. Lighten load if torso raises beyond 45 degrees in order complete repetition. I originally thought of creating a parallel grip pull bar as an alternative to the regular pullup grips. The pullup was a difficult exercise for me and I thought the position of the wrists and the stress on the forearms was limiting. The parallel grip pull bar I had in mind was simply an add-on piece of exercise accessory. No screws or nuts and bolts are needed to attach this bar to the rest of the exercise equipment. 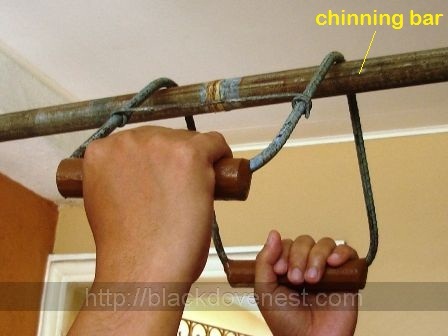 For the pull-up (or chin-up) exercises, this meant putting the parallel grip pull bar over the regular straight bar so that it hangs. You then grip both handles thus balancing yourself on the parallel grip bar as you perform the exercise. 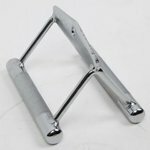 I realized that this add-on exercise accessory can easily be used to perform T-bar barbell rows. You simply slip the parallel grip pull bar under the loaded barbell bar and start pulling on both handles. In the photo below, I loaded one end of the straight barbell bar with a 25-lb. plate to demonstrate the use of the parallel grip pull bar as a T-bar row handle. That green thing on the floor is an inverted rubber floor tile where I set down the weight. It will prevent the barbell plate from rolling to either side. The best thing about this DIY project is that although the parallel grip pull bar is made of steel, you don't need any welding to assemble it. That's right, no welding required. Also, I only used available scrap materials so the steel specifications aren't cut and dried. Note that the measurements I used to assemble this homemade exercise equipment are for my own specifications. Change them if you have other preferences. You can create a smaller, handier contraption that you can bring to your gym in case your gym doesn't have it. Steel Bar, 8mm thick, 36" long - This will become the body frame of the parallel grip pull bar. I used the ribbed reinforcement bars (rebars) used in construction. Steel Pipe, 1" dia, 5" long, 2 pcs. - These two pieces will become the handles of the parallel grip bar. Steel Wire, 3mm thick, 9" long - For this I cut the wire from an old plastic-coated wire clothes hanger. Steel Epoxy Clay - This will be used to keep the grip handles from rolling and moving, as well as to cover the hollow ends of the the handles. You can buy this from most hardware stores. Paint and Paintbrush - This is to finish the surface of the parallel grip pull bar. Use an oil-based paint for durability. You have the option of choosing 2 colors. Pliers and Vise grips - This DIY project requires cutting, bending and forming for the steel wire. In the photo below, I'm holding the left handle of the parallel grip pull bar. Note the 4" legs of the pull bar form a couple of inverted V's.